In the last decade, both enterprises, as well as small and medium-sized, have embraced cloud because of its affordability, easy setup, and flexible nature. Organizations no longer need to purchase and maintain large servers in their office spaces. Instead, they can use a third-party cloud provider with a pay-as-you-go model to store data in the cloud, decreasing their overall costs. But to move data from legacy systems was a struggle and that is how hyper-converged and converged architecture came into the picture. What are the Components of IT Infrastructure? Internet platforms: A web hosting service is responsible for maintaining large web servers and provide the internet to the users. Converged infrastructure helps combine all the different disparate elements that power IT including management software, servers, applications, and virtualization. Overall, CI helps lower compatibility issues by reducing costs for power, floor space, cooling, and cabling. While the converged infrastructures can be put up on bare metal servers, in most cases all the components are virtualized. In the end, you get a cost effective and highly automated infrastructure which responds quickly to the changing requirements without the need to reorganize physical components or get new ones. There are some organizations that are still doubtful about setting up converged infrastructure (CI) because it seems too complicated, but the truth is that the companies which have adopted CI have noticed that a single platform system completely simplifies their day to day IT operations by making them more responsive, efficient, and coordinated. Not to mention, with CI, the IT department gets more control over the available resources making it easier to simplify and ultimately save costs. With CI, you can easily scale only the required components and leave the rest of the architecture as it is. If your application needs more storage capacity, then you can add more disk, or if you need more processing power, then you can add more CPU. Since there aren’t many hardware components, the maintenance demands are greatly reduced as opposed to traditional architectures. With the servers centralized, day-to-day maintenance also greatly reduces. With converged infrastructure, you are able to seamlessly navigate between private and public clouds, and divide the workload by placing the data in the most appropriate cloud. So you could store data on the private cloud that you need directly under your control, and the data for variable or unpredictable workloads can be placed on the public cloud. The CI systems include only storage and server resource components. The ratio of resources, including CPU, network, and storage are predefined and not as flexible as some users may want. Products cannot always be used for existing legacy systems or prevailing infrastructure. Both converged, and hyper-converged infrastructures have data storage options which simplify the use of resources and their implementation, as opposed to traditional systems. But hyper-convergence infrastructure takes convergence infrastructure to a whole new level by adding the benefits of convergence together and going beyond storage and servers. The biggest difference between those two is that while CI is hardware-based, HCI is software-based. The HCI is also designed to cut over 4 to 60 percent of costs from legacy infrastructure by removing separate storage networking and proprietary storage hardware. With a software centered approach, hyper-convergence infrastructure takes convergence to a new level to convert storage, computation and in some cases, network resources, into a single appliance. In HCI, each appliance or component serves as a self-contained node which you can easily scale up by adding more nodes. All the nodes are tied together into a cluster to form a single storage pool. Since HCI is software based and highly integrated, it’s not possible to use individual components for any other purposes. Basically, every node works as a server with its own storage which is directly attached, and all the nodes are grouped together through software driven architecture. Just like convergence infrastructure, appliances in hyper-convergence infrastructure also use virtualization to create a single resource pool. Though the main difference between CI and HCI is that even with virtualization CI is still a hardware based approach which creates some limitations, as discussed above. By integrating software layers, HCI is able to break free from all these limitations, streamline operations, improve resource utilization and also provide additional services like replication, deduplication, and disaster recovery. With HCI’s integrated systems, it’s possible to quickly and easily add new applications or services without extra costs for new hardware. That is because the software layer is mainly designed to be able to manage combined resources across multiple nodes while focusing on centralization. Flexibility and efficiency also increase with less dependence on vendor specific hardware. HCI is able to provide storage in different ties, right from spinning disk to a solid state storage. The storage resources can also be easily optimized according to the storage requirement of every node. With resource pools handling the requirements of specific applications by allocating resources to them, administrators can finally focus on applications completely. It becomes easier for IT staff to migrate workload much faster, as compared to legacy systems because HCI’s software focused data centres unify all the physical resources together. This allows the admin staff to not worry about compatibility issues between the hardware and software and focus more on activity scheduling and scripting. Hyperconvergence makes it possible for enterprises to deploy new tier-1 workload smoothly, without worrying about whether the existing environment will be suitable for the new workloads or not. In the future, you can also bring in the rest of the infrastructure into the architecture seamlessly. For every enterprise, setting up backups and disaster recovery is crucial to maintaining the flow of everyday work, even in the event of an attack or failure. With hyper-convergence, all those complexities are eliminated as it provides the simplest way to backup and creates disaster recovery. The best part of hyper-convergence is that it provides a seamless and nondisruptive implementation. It allows enterprises to easily phase out old architectures and phase in newer architectures without any disruption of any kind. The legacy system applications can also use the resources of the hyper-converged environment. Since the infrastructure is controlled through a single management system in HCI, it allows admin staff to control resources as if they were local resources remotely. So, you don’t need experts in remote locations to perform operations. Instead you can have all your experts in a single location and control resources remotely, enabling centralization. The public cloud infrastructure is actually owned by several organizations that promote and sell cloud services. Instead of taking an entire cloud server, which proves to be very expensive, you can get a part of a public cloud, which might be shared by a number of other users. Owned and operated by third party providers, public cloud infrastructure is best suited for small and medium sized businesses that have fluctuating demands but not the capital to manage and support their own cloud servers. 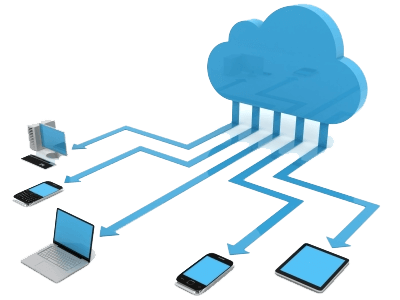 One of the biggest advantages of public cloud is the speed with which you can easily deploy IT resources. You also only have to pay for the server resources you need, so in a way, you can take advantage of its pay-as-you-go model and change the payment plans as your requirements go up. At the same time, since its public and shared with other users as well, it may not be the right choice for you if security is your main concern. With cloud being software centric, there is no need to worry about the underlying hardware. There is also no need to cross check if the applications can be supported by your system. Since all the resources are connected to the cloud, all you have to do is scale your cloud storage to run bigger applications. With hardware-focused systems, you would ideally have to buy a bigger and more expensive hardware to increase the capacity of your computers. But if you only had a need for a few months, it would still be a big one-time investment. On the contrary, cloud companies provide pay-as-you-go plans which you can subscribe to. So you could increase your storage capacity for a month or two and then go back to the original plan. Setting up data storage units in your organization can be a complex and hectic, to say the least. You not only have to calculate your current storage requirements but also predict your future requirements so that you don’t suddenly go out of resources. Now, you may end up using the entire storage quickly or you may not use half of it — leading to loss of investment. On the other hand, cloud companies provide the scalability that you require by adding infrastructure in small increments. With automation, cloud companies no longer need to continuously reconfigure their servers whenever a change in the infrastructure is made. Instead, the applications are designed to adapt to the changes automatically. By taking a VM-centric approach, administrators can easily backup their data and update replication policies for virtual machines without any extra work. As organizations started realizing the advantages that HCI had to offer, they also needed an infrastructure that could make the transition from traditional systems to the cloud. That is exactly the reason why HCI was invented from scratch — to maintain and support enterprise cloud. As the sales of traditional storage decline and public cloud continues to be on the rise, it is clear that HCI is the infrastructure of the present and the future as well and there are no doubts about it. Hyper-converged infrastructure can also help your organization decrease your carbon footprint and endorse a more greener environment. That is because HCI is able to decrease a company’s data center requirements by over 150% which leads to smaller carbon footprints and most importantly, lower operational costs. A thought leader, Jignesh leads Simform's Product Engineering team by DevOps Institutionalization, end-to-end product development and consulting led transformation programs. Subscribe To Our Cloud Computing Blogs! We publish well researched blogs about best practices, challenges and solutions on cloud computing. We hate spam, get blogs directly into your inbox!